We cordially invite you to join us at the seventh edition of the Macedonia2025 Summit that will take place from 7-10 November in Skopje, Macedonia. Macedonia2025 Summit is a premier regional gathering that serves as a platform for sharing knowledge and inspiring change in a region that is eager to transform. Having some of the greatest minds in business, science, and technology as our speakers, we shape the present into a tomorrow as a parallel step with the world’s leading countries. This year, with “Celebrating Success” as the Summit main theme, we aim to once again highlight leaders from around the world who implement best business practices and achieve great success. 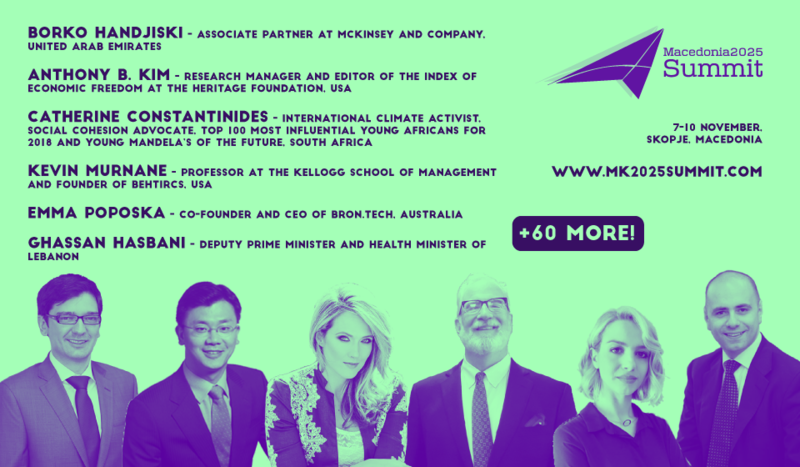 This year we expect more than 40+ top-notch speakers and a diverse audience consisting of 500 high officials, diplomats, executives, entrepreneurs, academia members and young leaders. We will put on pedestal the many success stories that became a reality through the investments done by investors and entrepreneurs. We will hear the stories of several internationally successful Macedonian startups, and we will promote great education and leadership development practices. As always, we will discuss global economic trends, this year showcasing leading examples in the fields of renewables, natural resources, energy, etc. As throughout the years, discussions on high-tech and IT will be present, plus adding healthcare this year as a new panel topic. In the previous editions of the Summit, we had keynote speakers like Dr. Guruduth Banavar, Chief Science Officer and Vice President, IBM Research; Harry Kraemer, Kellogg School of Management professor; Sandy Ogg, Operating Partner at the Blackstone Group; Mike Zafirovski, Board Member at Boeing, Chris Galvin, former CEO of Motorola; Suan Hiang Lee, President of the Economic Development Board Society, Singapore; Aco Momcilovic, CHRO at Rimac Automobili, Ruben Vardanyan, Russian impact investor and social entrepreneur, and many others. It presents us a great pleasure to invite you to join us for this event and leave your own mark in the shaping of a better, more efficient and more economically diverse future for the Southeast Europe region and the Republic of Macedonia.